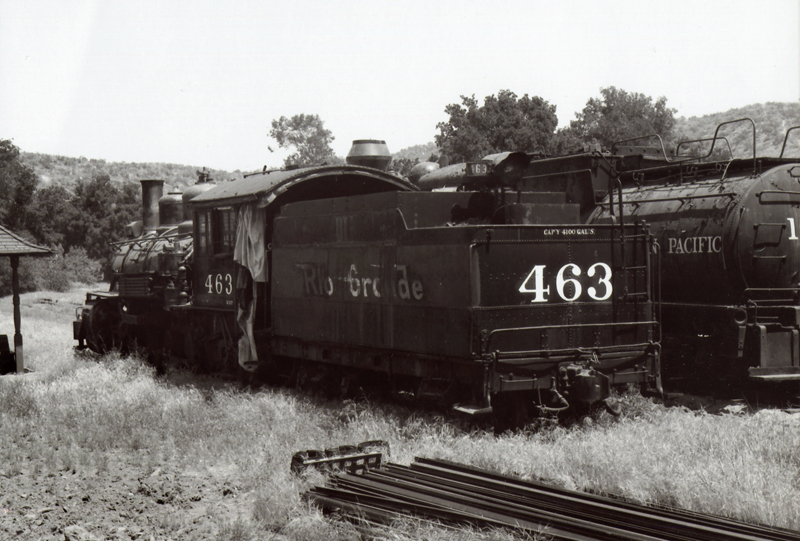 SCVHistory.com LW2750 | Melody Ranch | 2 Locomotive Engines in Boneyard, 1962-1972. 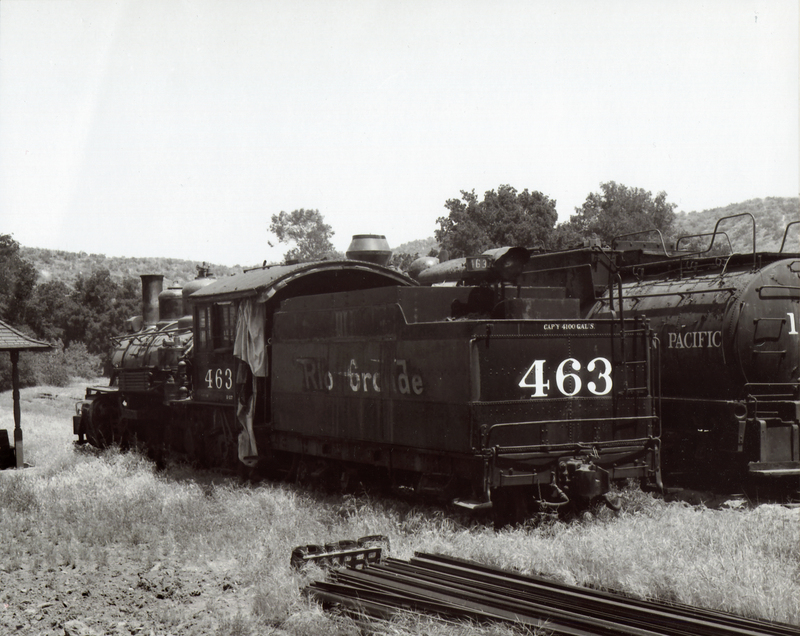 Two of the locomotives that actor Gene Autry collected, sitting in the boneyard at his Melody Ranch in Placerita Canyon, probably after 1962 and no later than 1972, when Autry donated the 2-8-2 engine in the foreground to the Denver & Rio Grande Railroad (see below). We can't positively identify the engine behind it from a single visible numeral, but it's probably the 2-6-0 Mogul No. 1629, which Autry donated in 1982 to the Santa Clarita Valley Historical Society. Southern Pacific Mogul Engine No. 1629 is a class M4 engine weighing 75 tons, with wheels 2-6-0 (two leading wheels on one axle, six powered and coupled driving wheels on three axles, no trailing wheels). The steam locomotive was built in 1900 at Schenectady, N.Y., and purchased by the Southern Pacific Railroad for use on the line that ran from Yuma, Ariz., to Portland, Ore., passing through the Santa Clarita Valley. When it was retired from service, Western actor Gene Autry purchased it and added it to his new and growing collection of locomotives at his Melody Ranch studio in Placerita Canyon. Engine No. 1629 was his fifth such acquisition; it was delivered June 17, 1957 (The Signal, June 20, 1957). It appeared in television series such as "Gunsmoke" and "The Life and Legend of Wyatt Earp." According to The Signal, in 1957 Autry planned to open Melody Ranch to the public and was preparing to lay track for a narrow-gauge train that would take tourists on rides around the ranch. It was part of his plan to open a Western museum on the property. The 1962 fire snuffed out that idea — but luckily, it didn't completely kill it. Autry would see his dream come true at Griffith Park. Autry donated S.P. No. 1629 in 1981 to the Santa Clarita Valley Historical Society, and it was moved April 22, 1982, to its present location next to the Saugus Depot using donated funds. LW2750: 19200 dpi jpeg from 8x10 glossy copy print (printed on Fujicolor Crystal Archive paper, which was introduced Nov. 30, 1997).